You are trying to go frugal yet want to buy high-quality products at pocket-friendly rates. And you are wondering how possible can that be? 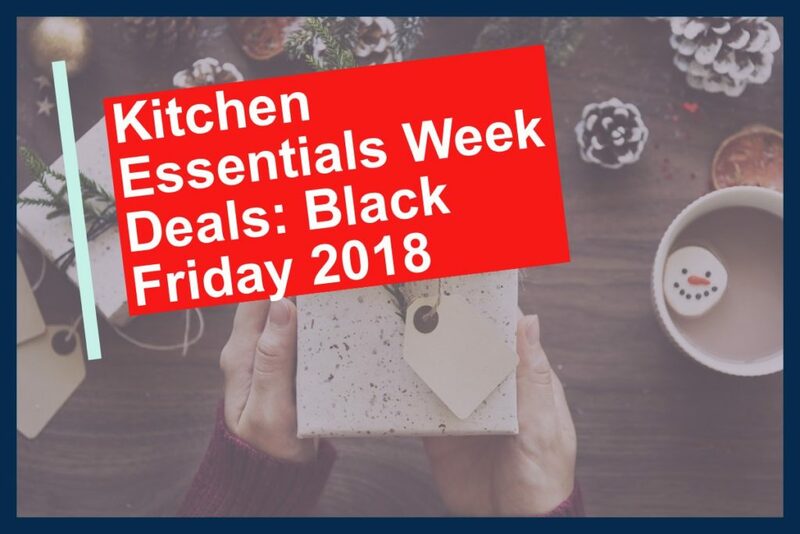 This is the right time to shop the kitchen essentials you have been planning to have for a long time. It’s Black Friday week and Cyber Monday is also around the corner which will be November 26th 2018. Why don’t you make use of this opportunity to save as much as you can with the best kitchen products? We have identified and compiled some great deals that will interest you. Below are some of them of Black Friday Deals. [SUPER SHARP KITCHEN KNIVES]- Surgical grade performance kitchen knives includes 8" chef knife, 8" slicer knife, 8" serrated bread knife, 5" utility knife, 3-½" peeling knife, 4-½" serrated steak knives(6 piece set). Heavy duty kitchen shears, Hardwood knife block dark cherry color, Decor board(13.8" by 9.9"). [SINGLE PIECE FORGED] - The stainless steel non-slip handle design was inspired by the sucker of octopus' arm. Precise stainless steel one piece forged reduce sticking & easy clean. Optimized weight and good balance make it fit nicely in the palm of hand. Recommend clean knives with water and soap, dry with a paper towel. Get 15 pieces of stainless steel knives from this single set under one purchase. Quicken your cutting experience in the kitchen with their super sharp blades and forget about tears when cutting onions. Whether you want to chop vegetables, bread or meat, these are the ideal knives for you. CERAMIC NONSTICK FRY PAN: Ceramic coating surface provides nonstick cooking for you. Less oil helps you to live a healthy life. It is not only easy to fry the food with great performance but also convenient to clean. It is really an effective kitchen helper. EXCELLENT HEAT CONDUCTION: This aluminum alloy pan provides better heat control, even heat distribution and long-term durability. It can be heated quickly to let you enjoy cooking and help you to save your time. It is safe for gas, electric and induction cook-tops. Use less oil and avoid annoyance that comes with the sticky pan when cooking by getting this non-stick pan. Made of ceramic coating, it’s safe to use and has a comfortable silicone handle as well. It offers the best heat control because it is made of aluminium. Enjoy making pasta like those of five-star hotels with this professional pasta maker. Being easily adjustable, you can now control the thickness of your nodules. Save up to 42% by buying it right now while Black Friday and Cyber Monday last. Serve more than one type of dish under one pot to your family and friends with this hot divider. No more worries of what to serve each person as you can now put different recipes in this post and let everyone choose what they want. BEST IN CLASS: This razor sharp, visually appealing, minimal slicing resistance, satisfying heft, premier bread knife makes an ideal gift for any chef. The 10-inch (25.4cm) full-tang razor-sharp design makes it an ideal, multipurpose tool, you can easily cut crusty breads, cake, bagel, soft fruits, pineapple, tomatoes and more. Your food will be sliced with precision, just like a professional chef - cooking never felt so good! HIGHEST QUALITY GERMAN STEEL BLADES: The ThyssenKrupp high carbon stainless steel blade provides you with top of the line, long lasting performance. The use of this high quality blade means that your knife will be rust, corrosion and stain resistant therefore ensuring low maintenance for you! The 56 rockwell hardness means that the blade is tough, hard and boasts exceptional edge retention, while the extra length gives you extreme cutting power and control. It’s time to enjoy extreme comfort as slice your bread with the Zelite Infinity Bread Knife. Entice your visitors with their visually stunning shape and quicken your cutting experience with their exceptionally sharp blades. Being made of high carbon stainless steel, they offer lasting performance. Live a healthy life by eating healthy foods like eggs. Cook a maximum of six eggs, whether boiled, scrambled or omelettes with this electric egg cooker. It comes with a measuring spoon, a poaching tray, a six-egg boiling tray, and an omelette tray. Save up to 33% when you purchase it now. HANDS FREE COOKING : Our sous vide stick shortens your active meal prep time. It takes 10 minutes to season, bag up or vacuum seal your food and prepare your sous vide container, lid, water balls and rack if you have them - your own at-home water oven. Then, let it run. No need to babysit the process, freeing up your time to relax. Easy to clean : The sous vide cooker's detachable stainless steel skirt and disks are dishwasher safe making this kitchen appliance easy to clean and maintain. Shorten your cooking preparation time with this cooker. Get results that you can’t achieve from any other ordinary cooker as flavours and juices don’t escape. It is not only easy to clean and you don’t have to baby sit the whole process. Don’t be left out with these fantastic offers. After Black Friday and Cyber Monday which is November 26th, all the prices will go back to normal which is usually slightly high. If you want to save more, check the available deals and buy now all the kitchen equipment that you need.